Most of today's flightless birds like emus, ostriches, cassowarys, and rheas are herbivores with small heads set on long, slender necks. These birds eat things like tender leaves. grasses, fruits, flowers, and the occasional insect or small lizard. Throughout the Cenozoic though there have been other types of flightless birds. Many of these had huge heads and powerful, crunching jaws. At first glance many people have thought that these scary-looking animals were powerful predators whose wicked beaks were frequently turned on the small mammals with which they lived. For some species this may have been an accurate description, but looks can be deceiving. The well known fossil bird Gastornis (formerly known as Diatryma), was a giant 2 meter (7ft) tall animal that lived in the forests of Europe and North America from the late Paleocene to middle Eocene. For over 150 years it has been depicted in art and media as a fast-running carnivore that hunted down the ancestors of modern horses. But things just do not add up. On closer inspection though, certain aspects of this bird's body stand out and point to the contrary. Its beak, though undoubtedly powerful, was heavy, blunt, and could not have delivered the swift, precise blows needed to dispatch prey quickly. The beak also lacked the hooked tip found on those of most modern predatory birds. Its eyes are set on the sides of its head as seen in most plant-eating animals, an adaptation which provides an expanded field of vision. Predators typically possess forward-facing eyes, providing an overlapping field of vision which enables them to judge distances accurately when attacking prey. Each toe of Gastornis ended in a blunt hoof instead of a claw. Carnivorous birds have sharp talons on their feet to hold on to prey as they kill or eat it. the shortened foot region and hoofed toes. In the forests and savannas of Australia lived another group of giant birds called the Dromornithidae, also known as the "thunderbirds" or the "demon ducks". The latter of the two nicknames refers to the group's close relation to ducks and geese. These animals first appeared during the Oligocene and died out shortly after the arrival of humans to Australia during the late Pleistocene. 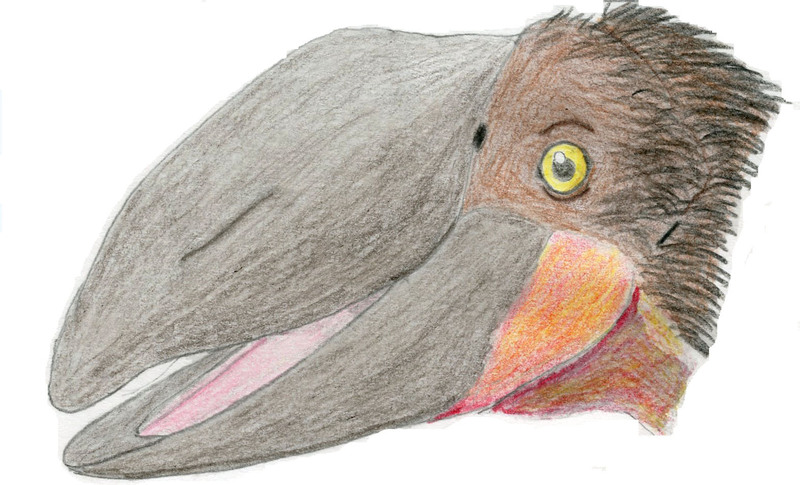 As with Gastornis, it has long been thought that many of these birds were carnivores, and that their huge beaks were used to crush prey and crack open bones. The larger species within this family, such as Stirton's Thunderbird (Dromornis strirtoni), the smaller Southern Thunderbird (D. australis), and the Demon Duck of Doom (Bullockornis planei) in particular had head and body proportions very similar to that of the earlier Gastornis. They had the same heavy, crushing beaks, long necks, robust bodies, hoofed toes, and short foot bones and long tibia that show they were not particularly swift runners (ironic given that the name Dromornis actually means "swift-running bird" in Greek). Studies have shown that the side-facing eyes of Bullockornis and Dromornis left a considerable blind spot directly in front of their faces, up to 40°. If these were predators they would have needed to take extra care to avoid tripping or crashing into trees when on the attack. Also, gastrolithes (stomach stones) are often found in association with skeletons, which are swallowed by herbivorous birds to digests tough plant matter. Gastrolithes have been found in herbivorous dinosaurs as well, such as the long-necked sauropods and horned ceratopsians. Crocodiles swallow stones too, but these function more as buoyancy aids. The highly acidic nature of the crocodile stomach is sufficient enough to break down any bone or keratin that they ingest. The best known and last species within this group, the late Pleistocene Mihirung (Genyornis newtoni), has been confirmed to be a herbivore. Chemical analysis of fossil eggshell fragments reveal that these birds were browsers that selectively fed on the fruits, leaves, and twigs of a wide variety of plants. The argument is that these birds must have been predators, why else would they need such huge and powerful beaks? But consider this, some browsing herbivores today do have at least moderately powerful jaws, usually the result of including more wood and bark into the diet as opposed to just the softer leaves and fruits. Forest Elephant, Black Rhino, and Common Eland are good examples. Those animals that regularly feed on roots and tubers also have well-developed jaw muscles. Gorillas and Pandas have immensely powerful jaws (stronger than those of many comparably sized carnivores), which evolved to process extremely tough plants like bamboo stalks. 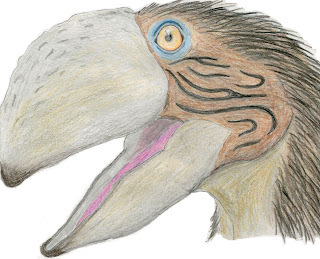 Gastornis and the Australian thunderbirds very likely evolved to exploit similar niches. Their massive beaks were used to break branches, crush thick plant stalks, and strip bark instead of for tearing through flesh, although females could have potentially eaten bones on occasion for the calcium within (the main component of bird egg shells). These giant birds were more akin to giant flightless parrots than ferocious land-hawks. 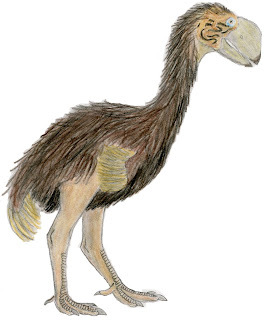 The Phorusrhacids, commonly known as terror birds, were a group of flightless birds that evolved in South America during the early Paleocene and lasted there until the Pleistocene. 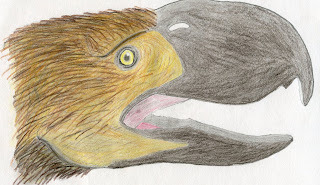 One species, Waller's Terror Bird (Titanis walleri), even invaded the southern United States 3 million years ago. There is no doubt that these birds were active predators. They ranged in size from small carnivore/omnivores probably the ecological equivalent of foxes and jackals, to truly massive predators that would have been the big cats of South America! Head profile of the terror bird Phorusrhacos longissimus. Like Gastornis and the thunderbirds, the terror birds had massive skulls (as long as the main body in some species). Unlike them, their beaks were not just deep, but narrow from side-to-side and built to withstand great impacts. Powered by powerful neck muscles, the skull and beak would have been wielded like the blade of an axe, driven downward with enough force to sever the prey's spinal column. This is the same killing method is believed to have been used by predatory dinosaurs like Allosaurus! Crucially, the tip of the beak has a large hook for tearing off large chunks of meat. The limb and foot proportions were clearly those of a predator. Some species had short, sturdy legs for ambushing prey, some had longer, more slender legs for long chases or short sprints. All species had 3-toed feet with sharp talons on the toes that could be used for traction while running or for anchoring carcasses to the ground while feeding. The manner in which these animals attacked and killed their prey must have been very similar to that of large theropod dinosaurs. Large mammalian prey would have been most likely stalked and rushed upon from behind. To minimize the risk of injury and ensure a swift death, most predators today target the head or neck of their prey and these birds were likely no exception. The momentum of the attack and the hammer-blow from the neck and open beak would inflict considerable impact damage. Death or paralysis would result from crushing or severing of the prey's vertebrae. Murray, P. F. & Megirian, D. (1998) "The Skull of Dromornithid Birds: Anatomical Evidence for their Relationship to Anseriformes (Dromornithidae, Anseriformes)". Records of the South Australian Museum 31: 51-97. Rich, P. (1979). "The Dromornithidae, an Extinct Family of Large Ground Birds Endemic to Australia". Bulletin of the Bureau of Mineral Resources, Geology and Geophysics 184: 1-190. Chandler, R.M. (1994). "The Wing of Titanis walleri ((Aves: Phorusrhacidae) from the late Blancan of Florida". Bulletin of the Florida Museum of Natural History, Biological Sciences 36: 175–180.